Before I organised my jewellery, my necklaces were either kept in a jewellery box or laid out across my desk, meaning they were always getting in the way or getting tangled up in each other. 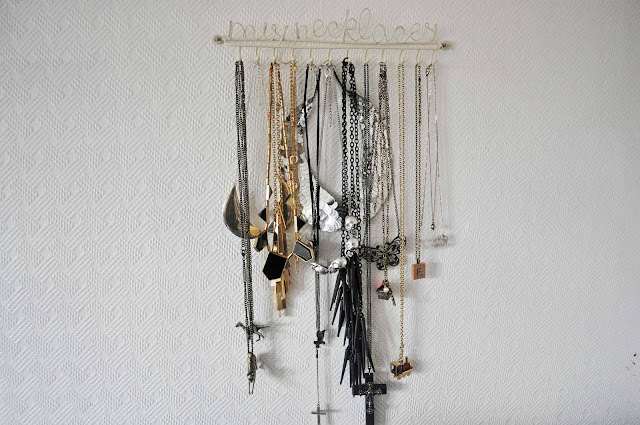 When you have a lot of necklaces this can become to be very annoying, so I decided it was time to invest in a wall hanger for them. I got this wire "My Necklaces" hanger from this eBay seller. I love shabby chic furniture and I think this fits in well, and even better, it only cost £5.75 with free postage, and it arrived within two days! 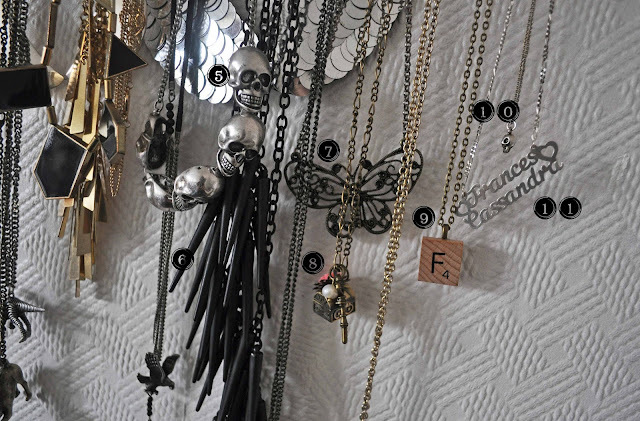 I distribute my necklaces randomly across the pegs (I like how some of them hang lower than others) and it keeps them from getting tangled and they are all visible and easy to find. I only keep my costume/fashion jewellery on this hanger- my more valuable and precious necklaces stay in my jewellery box. How do you store your necklaces? Yeah its soo annoying, everytime I want to wear a necklace ive had to sit there and untangle them all! 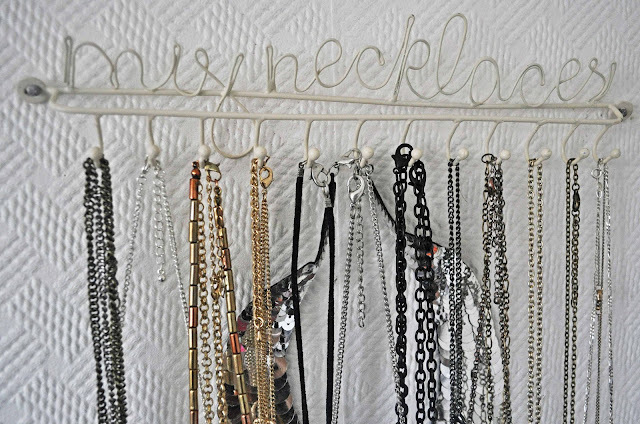 That hanger is just beautiful, I may have to get one for myself, I currently have a big Jasper Conran jewelery box but my necklaces end up all knotted together! Such a fab idea! Love it, all of them! Kisses! Ohh, I love your display piece so much! 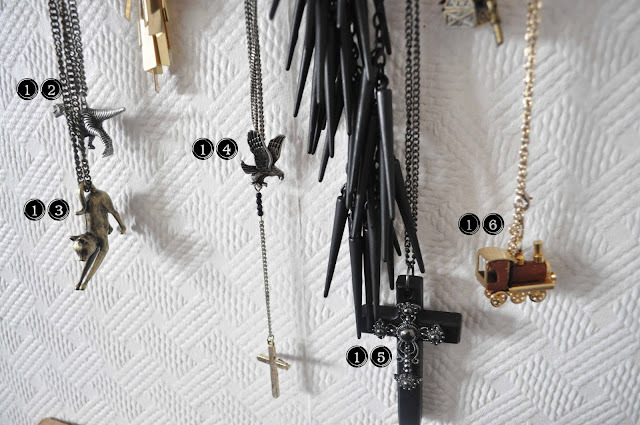 <3 and you truly have an amazing necklace collection! the necklace with a scrabble pendant caught my eye! its just soooo cute! Wow! 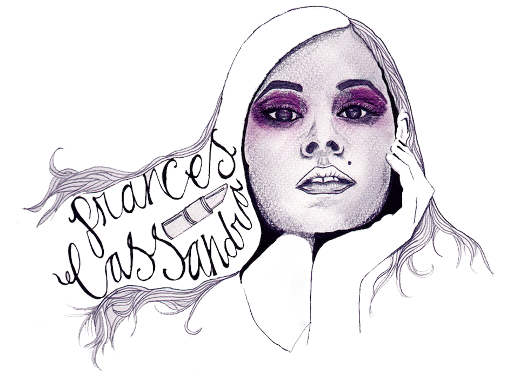 You really are in love with necklaces, Frances. Your collection is astonishing and is apparently composed of different styles. I admire your ‘my necklace’ hanger so much. 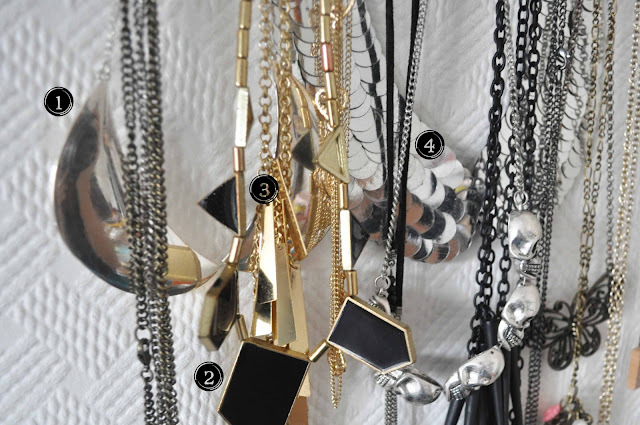 And, I think it is the best position you can put your necklaces on, in order to prevent them from breaking or tangling. Thumbs up! Your collection is worth to be proud of! :) By the way, do you happen to love handmade gold jewellery pieces too? Luxury Looks on the High Street. Top Five Tips for Review Writing. 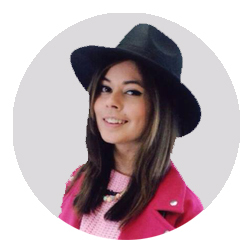 Review: Little Trinkets Handmade Jewellery. Review: LUSH Pheonix Rising Bath Bomb. Outfit: Black Lace and Tie-Dye Shoes.